^ Sheldon, Richard. Hammarskjöld. New York: Chelsea House Publishers. 1987: 28. ISBN 0-87754-529-4. ^ 4.0 4.1 Special Report on the Fatal Flight of the Secretary-General's Aircraft (PDF). United Nations. 1961-09-19 [2009-01-16]. ^ 5.0 5.1 5.2 5.3 5.4 Hollington, Kris. Wolves, Jackals and Foxes. Thomas Dunne Books. August 2008. ISBN 978-0312378998. ^ 1961: UN Secretary General killed in air crash. BBC. 1961-11-18 [2009-01-16]. ^ Platnick, Kenneth B. Great Mysteries of History. Hippocrene Books. : 11. ISBN 978-0-88029-157-6. ^ 13.0 13.1 Arthur Gavshon. 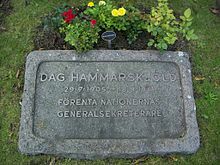 The Mysterious Death of Dag Hammarskjold. New York: Walker and Company. 1962: 58. ^ NOTES FOR MEDIA BRIEFING BY ARCHBISHOP DESMOND TUTU, CHAIRPERSON OF THE TRUTH AND RECONCILIATION COMMISSION 互联网档案馆的存檔，存档日期2012-07-16. ^ Gaddafi's address to UN General Assembly. 2009-09-23. ^ Dag Hammarskjöld: evidence suggests UN chief's plane was shot down. The Guardian. 2011-08-17 [2011-08-17]. ^ DAG HAMMARSKJÖLD - Second United Nations Secretary-General. [2014-10-11] （英语）. ^ Linnér S. Dag Hammarskjöld and the Congo crisis, 1960-61 (PDF). Uppsala University: Page 28. 2007. （原始内容 (PDF)存档于2013-06-03）. ^ Alec Russell. The road to redemption. The Financial Times. 2011-05-13 [2011-05-14]. ^ Hammarskjold House: A History 互联网档案馆的存檔，存档日期2011-08-08. ^ Sweden's new banknotes and coins 互联网档案馆的存檔，存档日期2011-09-27.